Director of Public Prosecutions of the Federation, the letter asked Mr.
assignment to oil majors, Shell and Eni. in Italy, UK, Nigeria, and the U.S. Representatives, before extending same to other Nigerians. must begin from the top. to fight corruption. Corruption is a hydra-headed monster. Niger State civil service earned over N1.3 million monthly. monthly earnings to N1.3 million. ill for weeks was brought to the church by her parents for prayers. President” would superintend over during his five-day tenure. handling in the absence of his boss. clear indication that Osinbajo was in charge. “You know that the President proceeded on the vacation from London so, no programme was prepared for him. to school pupils in some selected states. volunteer teachers in their communities. Recent attacks by Boko Haram have displaced more people in the insurgency-ravaged North-East. Boko Haram on the community. trial on the charges of diversion of N32bn arms fund. he met the bail conditions and was released by Kuje prison. “brazen” disobedience of the orders of court granting him bail. be said to have violated the bail order. 1999 Constitution for the enforcement of his right to liberty. September 12, 2014, which led to the death of 116 persons. Company; and Jandy Trust Limited. The court fixed the date yesterday, after several applications to stop their trial failed. engineers, seeking to stop their prosecution for lacking in merit. Unconfirmed report says one student has been killed. They were also reported to have broken ATM Machines and shared the money kept in there. A female hostel was reportedly attacked. Kogi State Governor, Yahaya Bello of has appointed Hon. Simon Achu­ba as the deputy governor of the state. House of Assembly, asked the lawmakers to confirm Achu­ba as his deputy. His action follows the refusal of Hon. James Faleke, the running mate to the late Prince Abubakar Audu, to accept the office. Audu in an election that was inconclusive due to the death of Audu. of Audu and not Bello. about intense debate in the State. “Up till today the first defendant has refused to honour the invitation of the court to appear before it,” the judge said. Mr. Buba adjourned till February 19th and ordered all the relevant security agencies to produce Mr. Ekpemupolo. accused of a multibillion naira fraud at the agency. Elem, Destre Consult Ltd, Gregory Mbonu, and Captain Warredi Enisuoh. Monday ahead of their court appearance, except Mr. Ekpemupolo. The former militant leader had continued to ignore the court’s order for his appearance. However, unlike previous court sittings, he sent a lawyer to represent him on Monday. primarily affects animals but also has the capacity to infect humans. receive much more rain than normal while others receive much less. 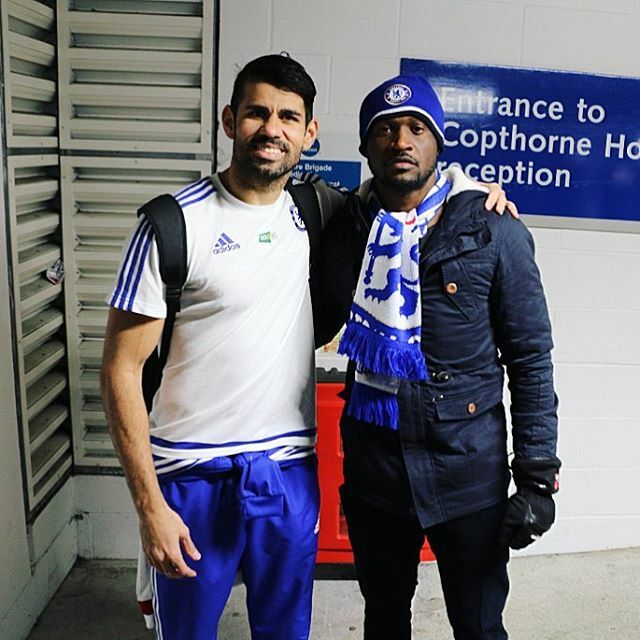 with some Chelsea players after Manchester United’s match yesterday. It would have been a different tale of tragedy after a scrap trailer fell on vehicles in the early hours of today around 6:15 a.m at Oja bus stop, Ogijo after Ikorodu. Emergency officials were alerted about the incident as they immediately swooped in to save the people trapped in the commercial bus. The prompt intervention saved the situation and no one died in the incident. The Senator representing Borno Central, Baba Kaka Garbai has said that the story that the insurgents have been degraded is nothing but a lie as the terror group still hold on strong to about 50 percent of troubled Borno State. Garbai who spoke to journalists on Saturday evening during a condolence visit to Dalori village where 65 persons were reported killed last week by the insurgents said, the truth about the accomplishment of the military in Borno State was never truly spoken as the Boko Haram and the Nigerian nation are presently administering about the same territories in the state. He said both the military and Boko Haram have full control of three separate local governments in troubled Borno State and share control in all the 21 other local governments. Garbai, who was in Dalori with financial and material assistance to the people of the village, said: “I feel highly demoralized, devastated in the sense that this is the village we came during the election and they were going about their normal business. The activities that were ongoing was like confidence building. “They actually got the signal a few days before the attack that the insurgents were likely to attack them,they reported to the constituted authorities but nothing was done. No fewer than 10 persons were feared dead yesterday, in an outbreak of fresh hostilities between Fulani herdsmen and farmers at Tom-Anyiin and Tom-Ataan communities, Mbaya, Tombu in Buruku Local Government Area of Benue State. This is just as the Council Chairman, Godwin Iorsue, the Divisional Police Officer at Buruku, the Area Commander and other stakeholders in the area, on assessment tour of the communities, were ambushed and attacked by the herdsmen who had seized the area and sacked the inhabitants. Vanguard gathered that the renewed crisis has created a huge refugee situation in the area with over 300 people displaced from the affected communities and scores injured in the bloody clash. A source from one of the affected communities disclosed that the Fulani invaders stormed the communities late Saturday night, shooting sporadically and burning down houses, huts, food barn, farmland and economic trees. The residents of Gwagwalada in Abuja woke up to this, recently. Representatives Standing Committee on Communications has been informed. A 39-year-old man, Sergeant Ologunowa Ojo, has been remanded in prison over alleged murder. Akodo, where he serves as a guard. The incident occurred on February 3, at the Shapati area, Elemo Ajah. allegedly shooting the deceased on his buttocks, using his AK 47 rifle. Ojo pleaded guilty before an Ebute Metta Magistrate Court stating that, it was an accident. and hit him in his buttocks,” he explained. According to him, he was thereafter rushed to the General Hospital Akodo where he later died. Ojo has since been dismissed from the Lagos State Police force. His offence is punishable under Section 221 of the criminal law of Lagos State of Nigeria 2011. The Magistrate, Mrs H.O. Omisore adjourned the continuation of the trial to March 9.
virus originated from Nigeria about 1,060 years ago. of living beyond expectations of Nigerians in the area of research work. the level of Ghana and Malaysia. things will change in Nigeria. across gender, age and professions. 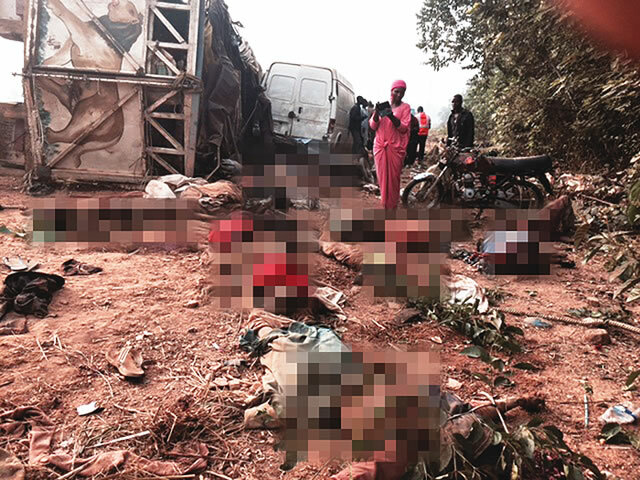 Seventeen people died and 74 others injured in an accident on the Lagos-Ibadan Expressway yesterday morning. The accident, which occurred shortly after Ibadan, involved two vehicles. There were 96 people inside the vehicles. as over speeding, which led to loss of control by one of the drivers. warned people “against sitting on top of trucks and lorries”. Kazeem said: “The accident occurred around SEPO Area before Dominion University, KM 19 at 0915. “Two vehicles were involved– a DAF Trailer White, Reg. No. XS626 LSD and another articulated truck. “It was caused by speed violation and loss of control. There were 96 people involved (95 men, one woman. “Seventy four were injured; 17 died. The victims have been taken to UCH, Ibadan Central Hospital, Kejide and Life Back Hospital. awards, in a photo recently posed with the 7 award plagues. Mixtape of the Year. YBNL won the Super Record Label of the Year. materials released under a specified year in review. in the movie industry as well as the role that changed the game for him. started out with acting for a concert group led by Ojo Ladipo in 1964. He explained that passion led him into becoming an actor and entertainer. Following this, he went on to acquire some needed skills which helped launch his career properly in the industry. because of the passion I have for it. Moreover, I have the talent. The Valentine day is around the corner and lovers are putting up plans on how to celebrate the season of love. 2baba had barely a week ago dropped another single titled Coded Tinz in which he features Phyno and Chief Obi.